A top Metro Schools official pocketed thousands of dollars in consulting fees from a group with ties to companies doing business with the district. NASHVILLE, Tenn. (WTVF) — A top Metro Schools official pocketed thousands of dollars in consulting fees from a group with ties to companies doing business with the district. But our NewsChannel 5 investigation discovered that Dr. Monique Felder failed to disclose money that she received in 2017 until auditors started asking questions. Felder is the district's chief academic officer -- the person that Schools Director Dr. Shawn Joseph brought with him from Maryland to head up instruction for the city's 86,000 students. In January 2018, Felder filed a financial disclosure in which she was asked to "list all sources of your income for the preceding calendar year." 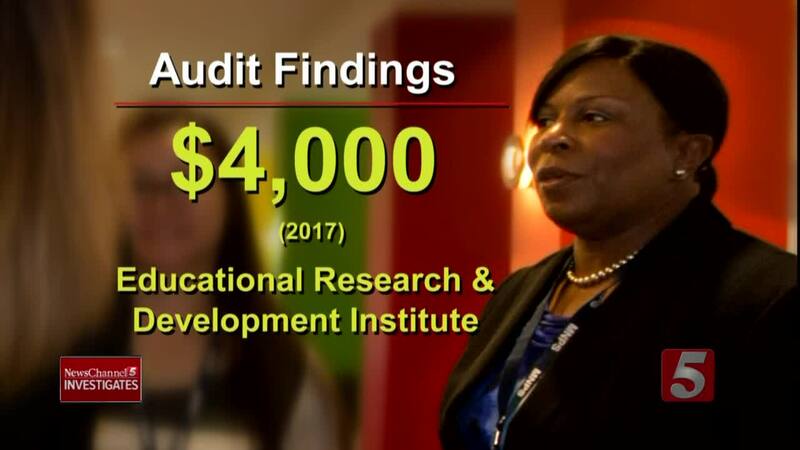 In fact, a recently released audit of Metro Schools says Felder had actually pocketed $4,000 in 2017 from the Education Research and Development Institute. ERDI is an industry trade group that pays school officials to sit down with technology companies, giving them feedback on products they hope to sell to those officials. The group's affiliated companies include eight with whom Dr. Joseph's team has signed contracts -- for more than $17 million. Back in June, school board member Amy Frogge publicly questioned the administration's ties to ERDI -- and the potential conflicts of interest when district officials take money from the group. "ERDI's sole purpose is to act as a middleman between school districts and ed vendors," Frogge told her fellow board members. But Joseph insisted that Felder's consulting work had been properly disclosed. The chief academic officer had reported receiving money from ERDI back in 2016. "Legal did clarify that it was not an issue, any ethics issues or problems. Therefore, we proceeded. And it was accurately reported," the schools director said. Then, in October, as Metro auditors zeroed in on Felder's fees, she filed an amended statement to disclose the money from 2017. The Metro audit report suggested the chief academic officer just didn't understand the requirement to "list all sources of your income for the preceding calendar year" and, since she amended her report, the allegation of undisclosed fees was ruled "unsubstantianted." "Sometime between it being identified by the auditor and the report coming out, it gets fixed -- that shouldn't unsubstantiated," said Metro Council member Bob Mendes. "That should be called substantiated. It happened. It got fixed only because the auditor pointed it out." Mendes serves on the committee that oversees the Metro auditor. He said the schools audit may reflect an unfortunate trend he's seen where the Metro auditor seems to want to avoid controversy. "A lot of times with investigations that happen in government, there is a desire by some to check the box, to say we looked into it, we fixed it and move on," Mendes said. "That's not necessarily what is best for the city." Back in Maryland, one of Dr. Joseph's mentors, Baltimore County Superintendent Dallas Dance and his successor, Verletta White, stirred up controversy when it was revealed that they had failed to disclose fees received from ERDI. Lawmakers questioned why companies would pay such big fees to get access to school officials. "You can do a bronze membership for $5,000, silver membership for $8,000 or a gold membership for $10,000 -- and they are guaranteeing sit downs," said state Sen. James Brochin (D-Baltimore County). "I just thought it was a very unusual way of doing business. It didn't pass the smell test to me." One of the ERDI companies is Performance Matters. Metro Schools now admits it broke the law in 2016 when it gave the company a $1 million, no-bid contract. "This aggravates me beyond your wildest dreams," said Metro Council member Steve Glover. Glover chairs the Metro Council's education committee. He said that, while Joseph and his team may want to spin the audit as good news, the details buried inside that report raise serious questions. "The crazy thing about facts," Glover said, "is exactly that, they are facts." As for the audit, Bob Mendes said the audit committee could vote to tell auditors to re-work the report if committee members decide there are just too many holes.